Another video from St. Helen's Bishopsgate in London that briefly summarizes the evidence for and significance of Jesus' physical resurrection from the tomb. Happy Easter! Jesus is risen, indeed! THAT'S EASTER Death to Life from St Helen’s Church on Vimeo. 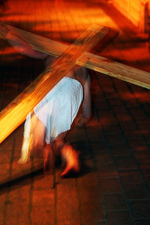 Why did Jesus Christ die by crucifixion on Good Friday? What was the purpose of his death? Here's a video clip that creatively explains why the death of Christ -- along with his resurrection -- is the central focus of His followers. It's not about a morbid preoccupation with guilt; it's about experiencing forgiveness! From the creative folks at St-Helen's Church Bishopsgate in London. HT Justin Taylor. THAT'S EASTER Life to Death from St Helen’s Church on Vimeo. Our family just began subscribing to National Geographic this fall, and so I was excited to see the December issue's cover story on the recent excavation and discovery of King Herod's tomb in Israel. The magazine does it's usual gold-standard job of providing beautiful photographs, drawings, and diagrams to accompany the article on Herod's architectural accomplishments, but then it flubs it up with a blatant inaccuracy regarding the infamous King of Judea. Contrary to the gospel account in Matthew 2:16-18, National Geographic claims that "Herod is best known for slaughtering every male infant in Bethlehem in an attempt to kill Jesus. He is most certainly innocent of this crime." Last Saturday we celebrated the wedding of our daughter, Audrey, to Chris Reid. What a wonderful day it was. Needless to say, we are very happy for them both. God bless you, Chris and Audrey! And to Chris we say, "Welcome to the family!" Here's our bunch surrounding the lovely bride and handsome groom, and thanks, Linzy, for the beautiful pix of Audrey and Chris. I've been thinking about Bob Dylan's song "Serve Somebody" this week as I studied Romans 6:15-23. As you may have noticed, I've not been too faithful feeding the blog monster lately. I've got lots of excuses. Suffice it to say that my plate is really full with preaching and pastoring at the Chapel and seminary classes: Church History II (Reformation to the Present) and Pastoral Internship. Hopefully there will be some interesting posts next week. Thanks for your patience. So we finally finished putting on the new roof shingles yesterday a little while after lunch. It's been a good but hard week working on this project. Needless to say, it took much longer than I thought. It's now done, praise the Lord. We're waiting for a good, hard rain to see if there are any leaks. I'm grateful to the Lord Jesus for several key blessings during our roofing experience. We had terrific weather. It got hot in the early afternoon, and a few of the days we had to stop because the new shingles warmed up and became soft. But we learned to go with the flow. We had no rain at all. We had no injures other than a few minor blisters and scrapes. No one fell off the roof! No one was hit by falling objects other than a small piece of scrap shingles. Bruce and Don replacing plywood sheets on the back of the roof. Some of the Labor Day gang: Earl, Steve, John, Pierce, and Mr. Mastermind, Wayne. Frank cheers as the new roof is almost completed. Praise God from Whom all blessings flow. They sure didn't teach me how to do this in Pastoral Theology class! Today, Friday, and Saturday, I and some friends will be replacing the shingles on our roof. Assuming we can put them on without injuring or killing ourselves and without causing the roof to leak, we should save more than half the cost of hiring a contractor to do it. The weather forecast looks promising for the next several days, so we should have the project completed by the end of the day Saturday, Lord willing. Don Upchurch wanted to know if I had ever had Shingles before. A mass-baptism by fire...hose! Gives new meaning to "sprinkling." 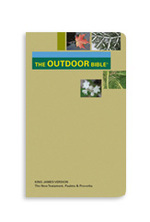 THE OUTDOOR BIBLE® is printed on 100% plastic material, which makes it a fully waterproof Bible. 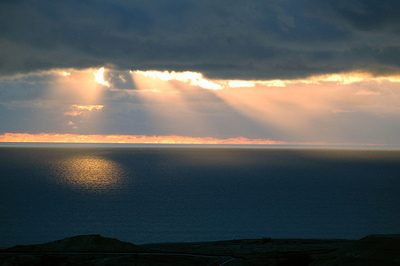 It can be rained on, snowed on, or fully submerged in a body of water – with no damage. THE OUTDOOR BIBLE® is made to withstand the rigors of the outdoors – whether used on a backcountry trail, a boating trip, or at a park with your family – THE OUTDOOR BIBLE® will endure your chosen adventure. 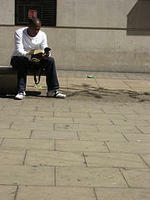 THE OUTDOOR BIBLE® will maintain its form during everyday handling and is resistant to typical outdoor wear and tear. I can see the benefits of having a waterproof Bible. During hunting season I carry an inexpensive pocket-sized paperback New Testament with some 3x5 cards and a pen, and as I sit and wait for deer to come by, I read. It's also a good time to do scripture memory work. If I get any insights or ideas as I read and think, I write them down. My trusty NIV New Testament with Psalms and Proverbs is tattered, dog-eared, wrinkled, and stained, but it has been with me in all kinds of weather situations. A thermos of coffee, a Snickers bar and a sandwich, and a Bible in the woods...it can be a blessed time. New Testament scholar Ben Witherington has posted a brief introduction to the art of Bible interpretation (hermeneutics). You can read his helpful article here. With a good bit of humor, Dr. Witherington emphasizes three key principles necessary for understanding a Bible passage in a way that is true to the text: "What it meant is what it means," "Context is king," and "Genre matters." Taken together, all three can guide us safely to a correct understanding of what God is saying in a section of Scripture. I also recommend the classic book, How to Read the Bible for All It's Worth by Gordon Fee and Douglas Stuart, to those interested in sharpening their Bible interpretation skills. This book ought to be part of your personal library. Want to score 30 runs in a baseball game? Just play the Orioles. Can you believe this one?!? The Texas Rangers pummeled/defeated/thumped/demolished/embarrassed/crushed the Baltimore Orioles 30-3 in the first game of a double-header yesterday. It reminded me of something you'd see in Little League. The Rangers broke a 110-year-old record for the most runs scored in a game. Ouch and double-ouch for us Baltimorons! Okay, so I've been a real shlub this summer, not posting at all on the Bible Blog. There have been a couple of big reasons for my absence from the Blogosphere, and most of them dwell inside my head. They deal with my personal expectations and motivations for writing, and I'm working through them. I know you don't read this blog to hear my whining, so I'll quit now. Recently, I received some encouragement to get back to the keyboard and start posting again. So here goes. I've been preaching on the life of David from 1 Samuel this summer, and it has blessed me to revisit the life of this man after God's own heart. In spite of all of his flaws--which are so much like mine--David tried to live his life on the same page as Yahweh. I've learned a lot from Bill Arnold's commentary on 1 and 2 Samuel in the NIV Application Commentary series, as well as Ralph Klein's in the Word Biblical Commentary set. Both gave me much exegetical help. But the best resource I found on David's life was Eugene Peterson's Leap Over A Wall, which is a collection of meditations based on David's adventures which explore "earthly spirituality for everyday Christians." Highly convicting and encouraging. I recommend this book to everyone! When my Greek 4 class finished at the beginning of June, I made a commitment to spend 15 minutes reading five lines of the Greek NT five days per week. So I worked through Galatians, and was blessed as I moved slowly through Paul's letter of freedom. "For freedom Christ set us free!" Galatians will probably show up in my teaching sometime this next year. 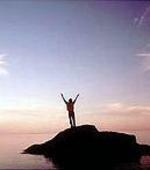 I hope I can daily live in the freedom Christ has purchased for us. As a father and husband I enjoyed going to Ocean City for a week with Dawn and our three younger offspring. We did a lot of surf-fishing, sun-burning, putt-putting, book-reading, bike-riding, and friend-visiting. Dawn found an incredible bargain online for the condo we stayed in, so we even saved money! I only regret that the week was so short. We really had a great time together. Two educational opportunities helped sharpen my ministry saw this summer. One was a class on "Biblical Preaching in a Post-Modern Culture" taught by Don Sunukjian who was a visiting professor at Columbia Biblical Seminary. This course has forced me reexamine how I handle the Bible as a preacher, especially in presenting its relevance. Sunukjian's system has been extremely beneficial though difficult to implement in my week-to-week sermon preparation. I also really appreciated this year's edition of the Leadership Summit. 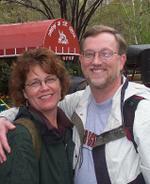 I went with eight other folks from Littlestown Chapel, including Dawn. It was a blessing to have her with me, and we've had some interesting conversations over what we learned. So...what have you been up to this summer?